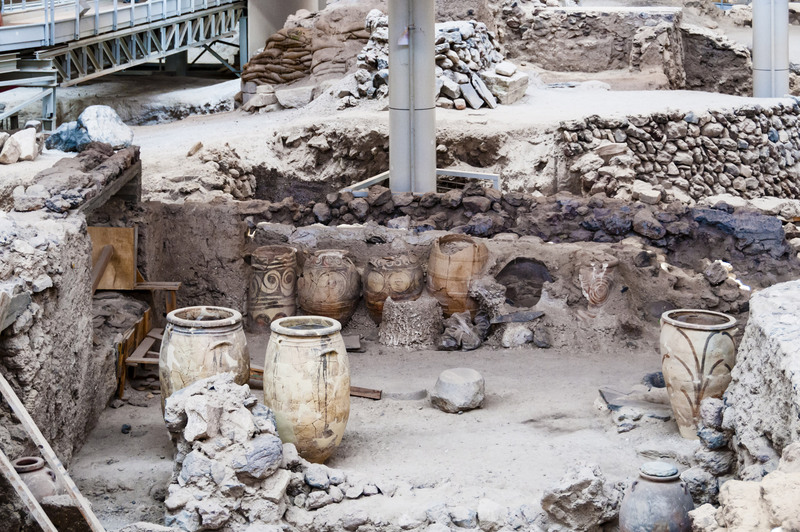 If you love history, Akrotiri might be the main reason of your visit to Santorini. In fact, thousands of people from all over the world are coming here just to visit this unique place with rather a common Greek name, Akrotiri. We can say that in Santorini we have 2 Akrotiri – one is a small settlement, a little village located about 2 km from the shore of the Southern Coast. But mainly talking about Akrotiri we usually mean the excavations of a prehistoric town, made by a famous Greek archaeologist, Spiridonos Marinatos, back in 1967. The excavations are located somewhat 1,5 km from the little village that gave the name to the place. Have you read a story of Lost Atlantis? Most of people sooner or later are captured by this narration brought to us by Plato. Some think it’s a legend, others – it’s a fairy tale. For hundreds and maybe even thousands of years many adventurers and explorers were searching this continent all over the world. The truth is that lately most of the scientists and archaeologists came to one conclusion – if this civilization has ever existed, most probable place of its location was…in Santorini. Believe it or not, we have several proofs that make Santorini the only possible Atlantis. To imagine the full glory of that prehistoric civilization flourishing here yet at least 3600 years back, combine a visit to Akrotiri with a visit to the Museum of Prehistoric Thira located in Fira in the city center, next to the bus station. The excavations have a bio-shelter, which means you can visit it at any weather. In summer the shelter is providing natural air ventilation while in times of cold and rain you are well protected and still provided with fresh air inside. Of course, the main concern was to keep this incredible town intact in time and away from any weather and destruction. The new shelter serves both purposes: keeps the traces of an ancient civilization in proper condition and gives you the shade and a chance to explore it as thoroughly as you wish. This is one of several places in the island with entrance fees. The adult ticket costs 12 Euros, while children up to 18 visit the site free of charge. Usual visiting hours are from 08:00 to 20:00. Make sure you check the schedule on holidays and religious holidays as normally there might be slight changes. You can discover the town on your own but will not understand much. A proper guide narration will open for you the whole world of things about Akrotiri you would never learn on your own. We offer you such a possibility providing a guided tour to this significant site.